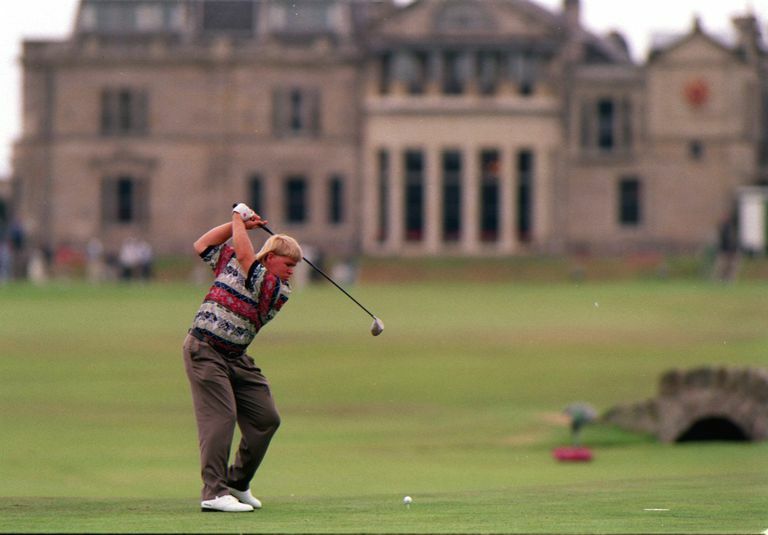 John Daly won his second major championship at The Old Course at St. Andrews, proving that he possessed a delicate touch in his short game to negotiate the huge greens and run-ups of the historic links. This British Open was also one of significant comings and goings: The 1995 British Open was the first played by Tiger Woods, and the last played by Arnold Palmer. Woods, still an amateur, made the cut, but finished well back, shooting 74-71-72-78--295. Palmer missed the cut with rounds of 83 and 75, but at least the man who revitalized this championship in the early 1960s got to have his farewell at St. Andrews. Two veterans, Ben Crenshaw and Tom Watson, opened strong before fading, sharing the first-round lead with Daly and Mark McNulty at 67. Daly shared the second-round lead with Brad Faxon and Katsuyoshi Tomori, with Constantino Rocca a stroke behind. Daly had a 73 in the third round and fell four strokes off the pace set by Michael Campbell, with Rocca in second two behind Campbell. But Campbell struggled to a final-round 76, leaving Daly and Rocca to battle over the final round. It looked like Daly had the tournament wrapped up when Rocca, who needed a birdie to tie, flubbed a pitch shot on the final hole, leaving the ball in the dreaded Valley of Sin on The Old Course's No. 18. But Rocca then proceeded to roll in the most unlikely birdie putt, up and over and down a swale and through the valley, some 65-feet worth of snaking, undulating putt. Rocca and Daly went into a four-hole playoff, where Daly quickly seized control. Rocca's chances were completly sunk when he hit into the Road Hole bunker on No. 17 and took three tries to get out. And John Daly was the 1995 British Open winner. Results and prize money from the 1995 British Open, played at The Old Course at St. Andrews in St.